Business Is Booming! What's Next? Define patches and upgrades and give examples of each. Explain the significance of package version numbers. Describe how to create a patch and an upgrade. As the lead developer for PartnerX, you’re proud to report that your AppX is a hit on AppExchange. You’re getting feedback from your customers and brainstorming your next steps. There’s no shortage of ideas on how to improve AppX. So what do you prioritize, and how do you deliver improvements? Answering these questions takes planning. Your customers are already using your solution, so some changes are tricky to deploy. Ideally, you can keep AppX’s upgrade process just as awesome for your customers as the rest of their experiences are. Patches—Minor changes, such as cosmetic UX updates or bug fixes, which don’t affect your product’s behavior. Upgrades—New or major changes to functionality that alter the behavior of the product and the way that customers interact with it. Suppose you find an inconsistent label you want to fix. Or perhaps you’re just fixing a glitch in a formula for updating customer data. These changes make great patches. For that amazing new feature you promised to your customers, use an upgrade. Upgrades let you make significant changes, like introducing better workflows or changing your data model. Before we go any further, let’s take a look at a simple tool for conveying information about changes to our customers: version numbers. We’ve all seen software version numbers. Broadly speaking, bigger numbers mean better products. That’s the hope, anyway! A major version number (2). Changes to major version numbers indicate large, sweeping changes to a product. A minor version number (1). A minor version number changes when you add a feature or change something noticeable in your product, but things still work essentially the same as before. A patch version number (3). Patch version numbers change every time you update your product with a patch. 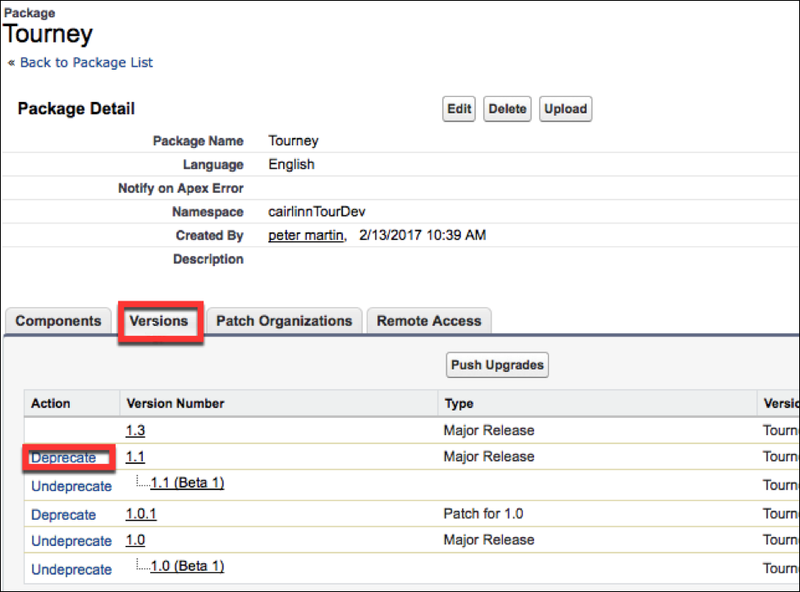 Patch version numbers are easy to manage—they change automatically every time you create a patch for your package. Major and minor version numbers change when you make an upgrade for your product. The biggest difference between major and minor versions is that customers typically don’t have to change the way they use an app when they do a minor version upgrade. Is your upgrade a major change or a minor one? You decide. Use the version number to manage customer expectations. How do you actually change your package? Let’s start with patches, since they’re easiest. Use a patch when you make a change that doesn’t affect the underlying data model or business logic. Patches can be created only off a major release, and only for a managed package. When you create a patch, you do the work in a patch development org. This is a special org that allows only changes that don’t break existing installations. 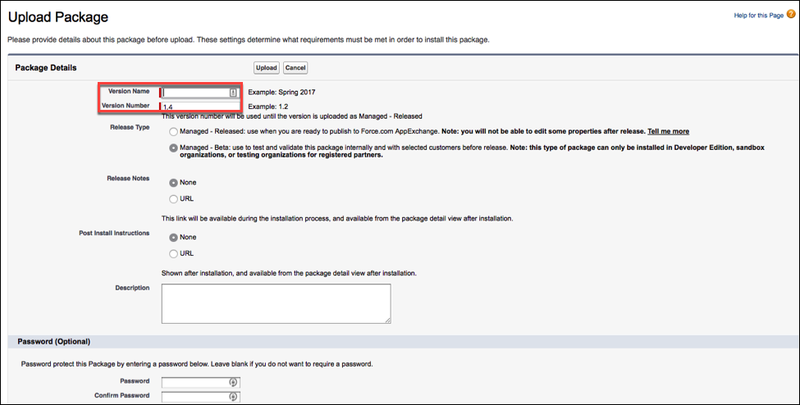 If you’re an AppExchange partner, you can create a patch development org after you log a case in the Salesforce Partner Community to get the right permission. For a complete list of restrictions, refer to the ISVforce Guide. 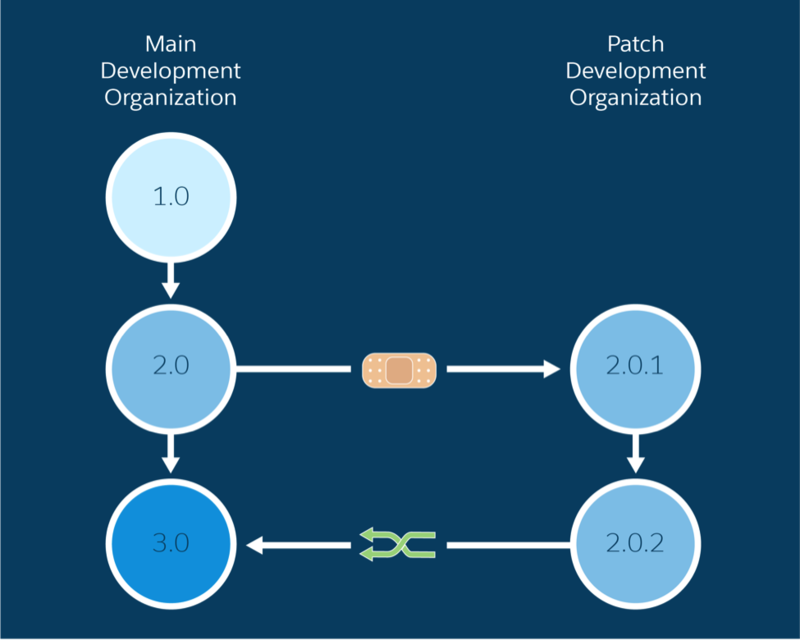 You create a patch development org using your packaging org, not your environment hub. You can connect a patch org to your environment hub after you create it. 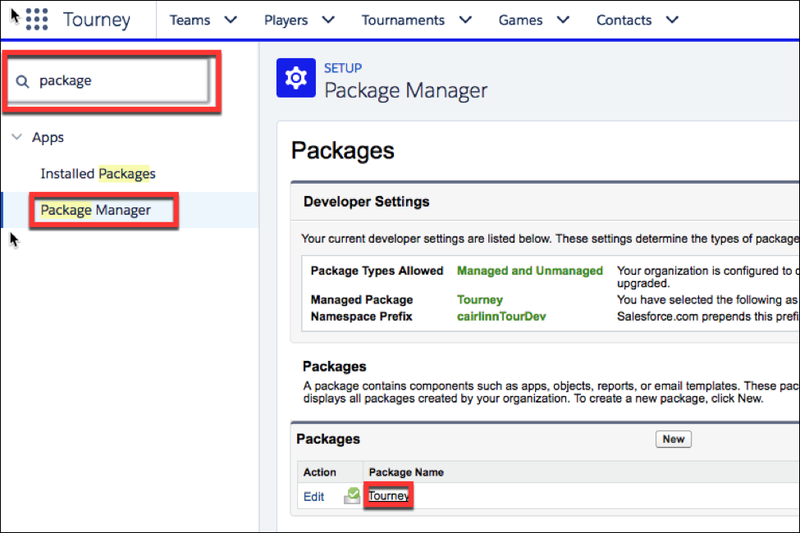 From Setup in your packaging org, enter Packages in the Quick Find box, then select Packages. Click your managed package, then the Patch Organization tab, and click New. Select the package version that you want to patch from the Patching Major Release picklist. The release type must be Managed - Released. Enter a username for a login to your patch organization, and an associated email address. A username is generated once you select the version (see the screenshot below), but you can change it. The email address should be your main email where you receive org logins and password resets. These are specific to your patch development org. Suppose you’re making changes to version 2.0 of your app. You create a patch org and create two patches there, versions 2.0.1 and 2.0.2. Later, you merge these patches into version 3.0, which you distribute as an upgrade. When you merge your patches into version 3.0, you’re finished with this patch org. Create another patch org for any patches to version 3.0. For the nitty-gritty details, see the ISVforce Guide. You’ve got major changes in the works—new objects and business logic, Lightning components—and you want your customers to get them. For that, you create an upgrade for your package. You can upgrade only a managed package. Some components can’t be upgraded. The ISVforce Guide has information about which components are upgradeable. Before you start, decide whether your upgrade deserves a major or minor version change. This alerts your customers to what they’re in for. 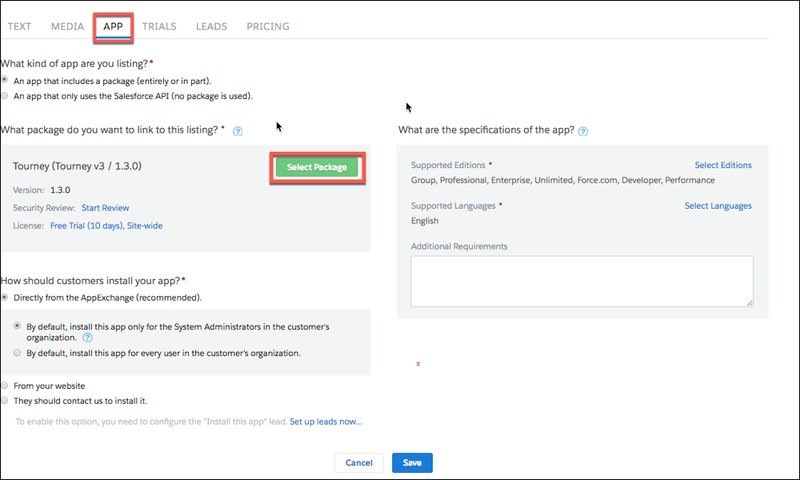 If you want to remove a component from your package, log a support case on the Salesforce Partner Community to enable the Component Deletion permission in your packaging org. You can delete only certain components—see the ISVforce Guide for the details. 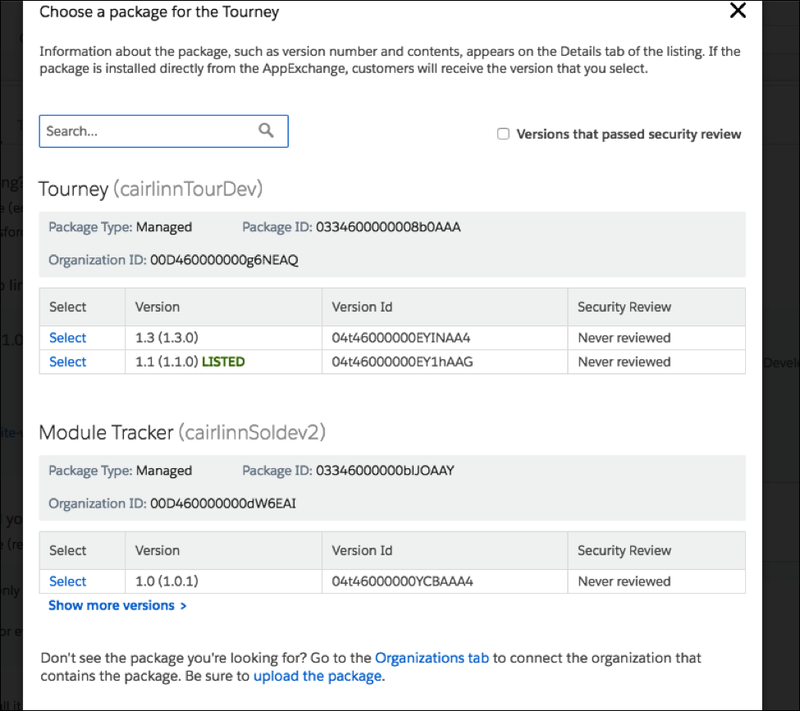 From Setup in your development org, enter Packages in the Quick Find box, then select Package Manager. Then select the package from the list of available packages. Any components you change appear in the Component sub-tab, along with any new dependencies. To add a component manually, click Add. Select the appropriate Component Type, check the checkbox beside the desired component, and click Add to Package. Below we add Active and Customer Priority custom fields. When you’re ready to create the package, click Upload to create a new version of the package. This brings up the Upload Package page. In the Version Name field, name this version of your package so it’s consistent with your previous versions. The Version Number field contains a suggested version number that you can override. Click Upload again to finish the package creation. You receive an email with a link to the package on AppExchange. Share this link with your customers who want to install this upgrade manually. Use the list of installed users from the License Management Application to spread the word. The package manager lets you deprecate older versions of your package. That prevents customers from installing these versions, though existing installs continue to work. This makes maintenance easier. We’ll get back to maintenance in the next unit. You’ve made all the changes you’re going to make, rigorously tested them, and uploaded your managed package. You’re just about finished. There are only a few things left to do before you deliver the goods to your customers. If you have a product on AppExchange, you know that trust is our number one priority at Salesforce. After all, your app made it through our security review process. Your patches and upgrades must meet the same security standards as your app. Now some good news: You don’t have to go through a full security review for every patch or upgrade. When you update your product’s listing, the Salesforce security operations team reviews your code within 24 hours. For a refresher on our Security Review process, check out the AppExchange Security Review module. Now that your shiny new product is ready, it’s time to update your AppExchange listing. From the Salesforce Partner community, navigate to Publishing. Then select your listing. Navigate to the App tab. Under “What package do you want to link to this listing?” click Select Package. Select your package from the list. You’re using Test Drive or Trialforce to offer your customers a free trial of your product, aren’t you? Of course you are! Let’s update your trial while we’re at it. How you do this depends on the type of trial you offer. 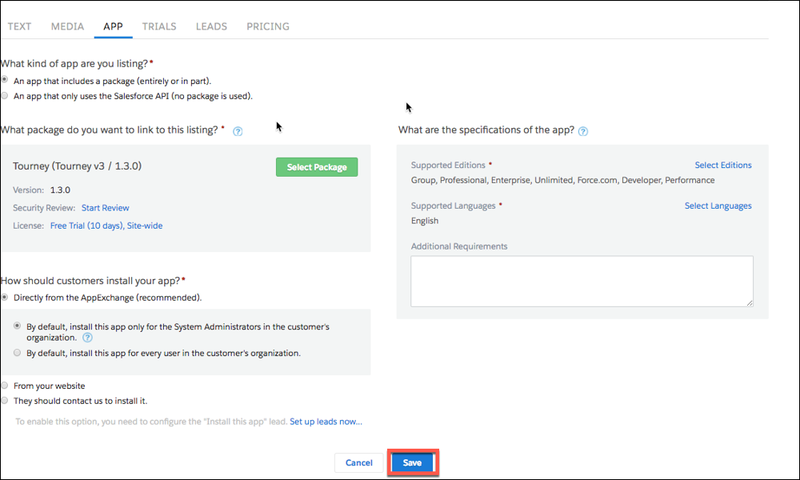 Installable Trial—Your customers install your trial in their own org. Make sure your listing is up to date, and your customers can simply install your new version. Test Drive or Trialforce—Install your new version in your Trial Source Org and create a new trial template. Don’t forget to update any test data and submit your template for security review. If you aren’t offering free trials to your customers, head to the AppExchange App Trial Management module to learn about them. And that’s it! The new version of your product is ready to go. Now let’s look at how you distribute updates to your customers, SaaS-style.